On August 25th 2011 I had a mini stroke caused by a Vertebral Artery Dissection. My doctor told me it is OK to do aerobic exercise but not yoga in order to avoid over extension of the neck. He also recommended not to lift heavy weights. I've never done Pilates before, so I'm wondering if it is a type of exercise that I can do with this kind of injury. Do you have any experience or knowledge on this matter? Your answer is greatly appreciated. I would recommend doing Supervised Pilates sessions with a well trained instructor. I have included a link to the Pilates Method Alliance here. Interview several Pilates Instructor's and make sure they are confident in working with you and your condition and keeping you from overextending your neck. Pilates equipment uses spring tension so the weight is not heavy or hard on the joints and you can focus on your form and posture gradually strengthening your spine and core muscles that support it. When you exercise it is important for you to control your movements with focus and precision. These are principles of Pilates and the exercises should be executed precisely during each workout with detail on form. I would recommend when beginning your Pilates exercises lying flat either on a mat or the reformer with a bit of a pillow to keep the neck from overextending. Do not raise your head off the pillow. You can execute all of the movements with your head down, being sure to keep your ribs and as much of your back against the mat or table. Taking into account, of course, the natural curves in the spine. You can view some of my reformer workouts here. Sometimes this mini-stroke can cause vestibular/balance issues so it is important to work on improving your balance and your posture. 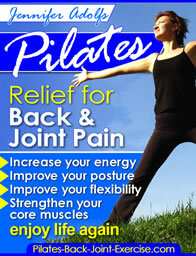 Pilates is great at strengthening the core muscles and improving posture at the same time. I would invite you to begin doing some of these balance exercises using Pilates Principles. You can view some of my Pilates-based standing balance exercises here.